Finally...my brother is not a bachelor anymore. Here's the pic of him with his bride. Her wedding lehenga was embroidered and embellished with stones and weighed 10 kilos (22 Pounds). It'll be reaching our home soon and then I'll show you some close up pics. My brother's sherwani was also embellished with stones. On the other hand,my sari for the wedding was lightweight with simple embroidery patches and sequins all over. The fabric was net and hence not heavy at all.Here it is.. Here is a close up of the embroidery on the sari. The sari in itself has three colors - Peach,Pink and Purple. Since we're talking about wedding attire, why leave the footwear behind? My footwear for the marriage also had some embroidery in it and lots of stones. You can click on the pic for a better view. What you see below is my DH's pair of Jootis. Jootis do not have left and right foot distinction. You can wear them on any foot. Well, I'll stop it here though there's lots to show and tell. For two days, we were treated like royals , made to eat non stop ( I need to check how much I have gained) , and made to dance non stop (maybe that would've kept me from gaining too much). It was fun and a welcome change from the daily routine and mundane chores. The only thought that bothers me is what should be done with all these stuff we've bought.The biggest issue with the wedding attire is that they cannot be repeated. Such a colossal waste!! Will come back with some pictures of SIL's wedding dress and her jewellery. So beautiful customs you have!!! Thanks for sharing these photo's. The brides dress looks very pretty, I'm looking forward to see the details. Beautiful wedding attire! Your sari is such lovely colours and it's so sad that you can't wear it again. The fabric is lovely to work with though, so I'm sure you can create something out of it. Congratulations to your brother and SIL! They look incredibly happy! ...and beautiful! Your whole outfit is just stunning. I think you could have been the belle of the ball after the bride and groom. I loved your DH's jooties...gorgeous. you have some wonderful customs. I love the colours. 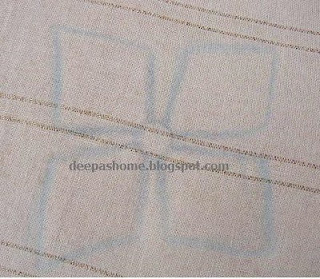 Hi Deepa, I have been visiting your blog for a bit now, very nice and useful info about Indian embroidery techniques!! Thanks for documenting...I have just started blogging at the5cees.blogspot.com, I hope you will stop by to visit.